Close-up you can see so many fun details about the balcony succulents. I like how these have different leaf forms, but both have vermillion edges. I have four succulents in three flowerpots, which makes a great small arrangement. 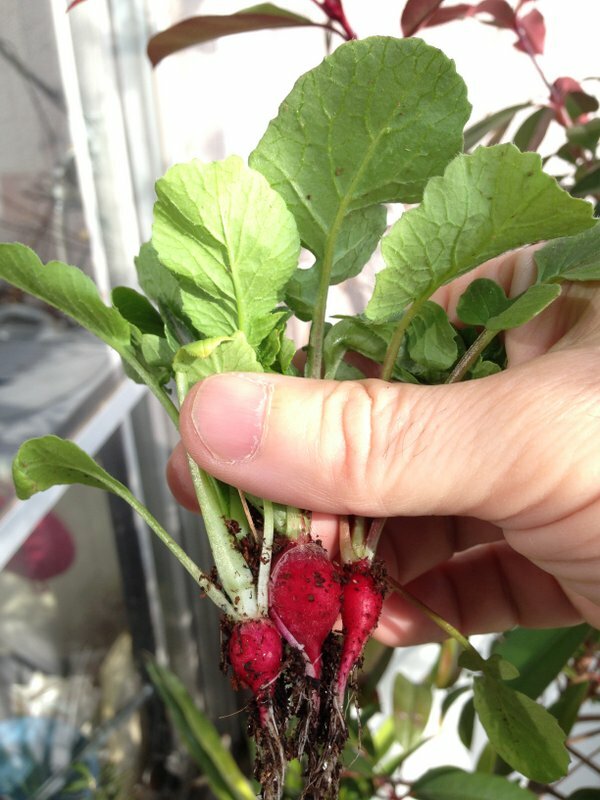 My balcony winter crop is radishes and snap peas, planted by seed. My Tokyo farmer friend Joan advised me to plant densely, and eat my way through the thinning process. The leaves are surprisingly tasty, as are the mini-red radishes. This red and green leafed bush, called kanamemochi (カナメモチ), is one of the most common hedges in Tokyo. I have a single plant, which used to be in front of the air conditioner. Now that we’re using the AC and blasting hot air into the balcony, I’ve had to move all the plants that used to be in front of it. I just potted it up, so hopefully it will become a thicker and better screen. I bought this dark leafed plant as filler and good contrast in leaf color. When I brought it home from Shimachu, our home center, I realized that the front label doesn’t even mention a horticultural name. It’s simply called “terrace bronze,” and it’s marketed as a balcony plant in their “terrace series.” Oddly, they even suggest it as a “green curtain” plant, although it would make a better weeping wall cover than climber. On the label’s flip side, the tag explains how Suntory reserves all rights to this species, including any future plants. Kind of scary, no? I love the shape of this kiwi vine’s leaves. They look so fresh and new. I am not sure if you need a male and female kiwi to produce fruit. I hope one of our neighbors has the right sexed kiwi to activate ours! Did you know that cosmos are a fall flower in Tokyo? You see them everywhere this time of year, so I picked up this one from my neighborhood flower shop. This fall my garden has a lot of pink (roses, fujibakama), deep blue (Okinawa morning glory, lavendar, salvia), and white and yellow (pansies, marigold, geranium). The blueberry bush leaves are also turning red and gold. I am a big fan of Okinawa morning glory and Edo morning glory. The Edo ones typically have a white border and stripes, and come in many colors. They’re very showy, a good size for domestic spaces, and they evoke Tokyo history. The Okinawa morning glory is a deep blue perennial, and quickly spreads and covers much more space. Both share a distinctive leaf shape. 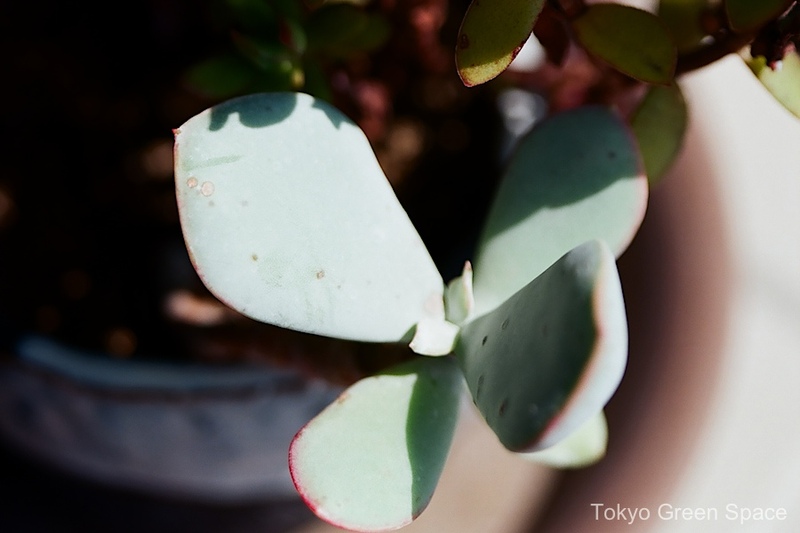 People are surprised when I tell them that I have at least one hundred plants on my small Tokyo balcony. It sounds like a lot, but actually it’s easy to accumulate. Even a small garden can have many layers. I was aiming my camera at the fairly large bonsai in the center, made by my friend Matthew. It has two types of grasses, two types of mosses, and a fern. Some neighboring mint is stretching above that singularly planned assemblage. And at the bottom left are two small succulents in a flowerpot with drawings from my mother-in/out-law. There’s also a trunk and leaf from two neighboring bonsais. That’s at least ten plants in this one close-up. This parking lot palm tree has so few leaves yet so many flowers. No wonder the shuro palm tree spreads so easily in Tokyo. This is the second year that I am growing this beautiful daisy-like cream flower with very soft leaves, Actinotus helianthi, known in Japan as “fairy white” (フェアリー・ワイト). 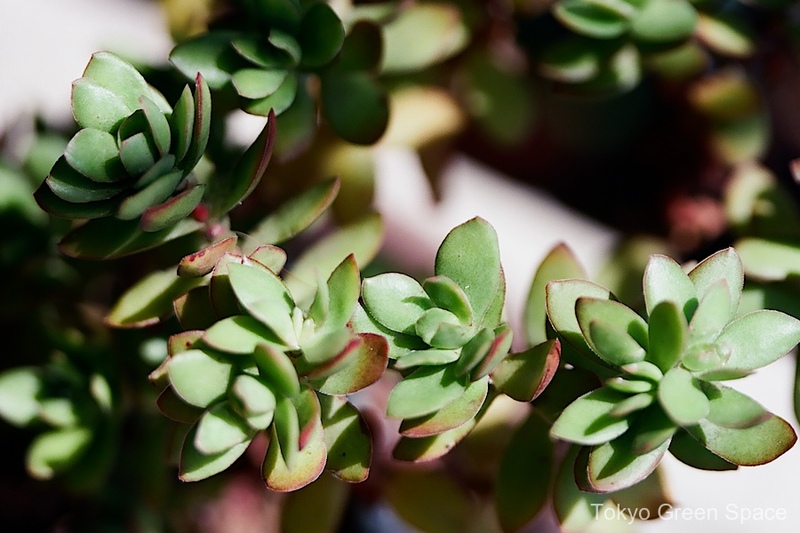 I think it’s odd that a plant that is iconic of Sydney, Australia, where it is called Flannel plant, does so well in Tokyo. My San Francisco gardener friend Hank was amazed to see it in Tokyo. The Wikipedia page suggests it likes well drained soil, so perhaps it was destined to be a potted plant! This small oak tree in my satoyama box is pushing out new leaves and flowers. I am a big fan of 5bai midori’s modular boxes full of native trees, bushes, and small plants. This box measures only 20 by 20 by 20 centimeters, yet it is full of plants and surprises. Some of them are evergreen, and it’s fun to watch the rest of the box revive in spring. Update: I found the tag, and the tree is called konara in Japanese (コナラ). It’s an oak, with the Latin name (Quercus serrata). It’s a very typical Japanese forest tree, and its ample sap attracts good beetles like kabutomushi (カブトムシ). I wonder if we’ll get acorns out of this tree. Maybe you don’t associate cherry trees and palm trees. They are an odd pair, with this type of palm tree being a self-sower in Tokyo, and the cherries being selected from nurseries and carefully tended for decades. By now, the cherry blossoms are ending. The petals pool up in a pink carpet, and new leafs shoot out from the dark branches. Once there’s more green than pink, this cherry mini-season is officially over. Here are some photos of cherry blossoms seen walking and taking the train in my neighborhood. A dusty elementary school soccer field is bordered by shuro palm trees and cherry trees in full bloom. Waiting for the JR train, the platforms face into a canopy of mature trees. On a small street, fallen blossoms attract a child’s attention.